How cold was Apple Cup? So cold that Cougars’ thinking was affected post-game, included one who thought 3-9 was “awesome” season. 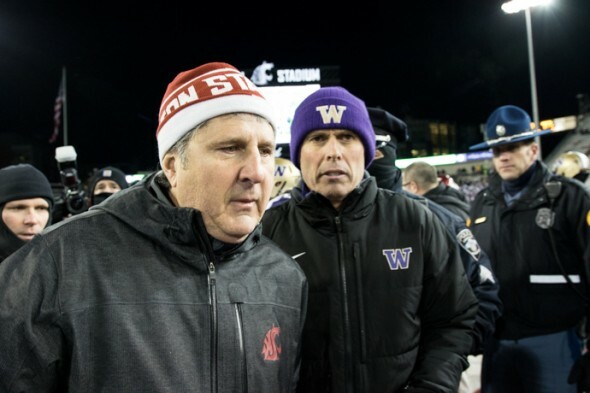 PULLMAN – The Apple Cup was played in mind-numbing cold Saturday night. Literally. That’s the only plausible explanation for some of the nonsense spewed by Washington State players after their latest train wreck of a season came to a merciful halt, courtesy of the Washington Huskies. WSU’s 31-13 loss – the final score did the Huskies no justice, since they led 31-0 before giving up two meaningless touchdowns in the final 10 minutes – left the 3-9 Cougars with half as many wins as a year ago. And, unlike last year, no bowl game. And, unlike last year, stuck in last place in the North Division of the Pac-12 Conference. You say tuh-MAY-toe, we say tuh-MAW-toe. Myers says aw-SUM, we say aw-FULL. Good grief. Why not just hand out participation ribbons to all the Cougars? Did everyone have a fun time? Peachy! Let’s do it again next year! And the year after that! And the year after that! Myers seems like a nice young man, and he’s certainly a fine player. Perhaps he was a bit dazed. Some of the Cougars were hit so hard, one feared their frozen body parts would simply break off and stick to the turf until a spring thaw arrives in Pullman. Perhaps no WSU player was more confused than LB Peyton Pelluer. He grew up a Huskies fan on Seattle’s east side, and his family is chock full of allegiances to both purple and crimson when it comes to our state’s football version of Hatfields vs. McCoys. Pelluer said “a lack of communication” contributed to WSU breakdowns on defense during the Apple Cup. It’s difficult to argue with Pelluer, since WSU’s starting cornerbacks had polar-opposite takes on RB Dwayne Washington’s 51- and 60-yard touchdown runs on the Huskies’ second play from scrimmage in each half. “We weren’t lined up where we were supposed to be,” Daquawn Brown said. For the record, WSU coach Mike Leach sides with Pippins. For that matter – to shamelessly steal an old line – Leach is all for his players’ execution. To be certain, something drastic needs to take place amid the rolling hills of the Palouse for WSU football to return from the dead. Sorry, last year doesn’t count. A 6-7 season capped by mental and physical collapses of epic proportions in the team’s first bowl game in 10 years does not qualify. The Cougars are doomed as long as “awesome” includes three games with more than 50 points allowed (and two more with 40-plus points allowed). Or when they barely gain more rushing yards in one season (478) as Oklahoma freshman Samaje Perine gained in one game (427). Or when they pass for 601 yards (at Arizona State) and lose by three touchdowns. Or when they force just eight turnovers (three interceptions, five fumbles) all season. On Saturday, even a pregame pep talk from the great Steve Gleason was not enough to inspire the Cougars to greatness. Gleason, able to speak only through the magic of technology due to the vicious effects of ALS (Lou Gehrig’s Disease), is the former Washington State and NFL player who has inspired the world with his courageous battle against an incurable malady that has restricted him to a wheelchair. A sellout crowd erupted, and even a few Huskies on the sideline cheered, when Gleason was wheeled onto the field between the first and second quarters after being inducted into the WSU Athletics Hall of Fame. Some very large, tough men shed some very large, wet tears. “I love Steve Gleason and what he’s about and how he’s a fighter,” Myers said. “He’s just a great example, a great person,” Leach said. Any coach could use a large supply of players as proud and energetic as Gleason. The Cougars have some players of similar virtues, and a host of promising young players in WSU’s starting lineup Saturday included three freshmen. The Huskies also started three freshmen, but they were backed up by nine senior starters (it’s usually 10). The Cougars started six seniors, one of whom (little-used running back Theron West) started on Senior Night ahead of regular starter Jamal Morrow, a freshman. “There’s a ton of kids who probably played earlier than they should have (this season),” Leach said. “They’re going to develop their skills, and eventually some of them are gonna become great players, and some of them are gonna become good players. In Leach’s defense he lost several valuable starters from last years defense due to graduation. For a successful season you need a balanced team and that wasn’t there when the season started. If Cougar fans are calling for Coach Leach’s head they’re crazy. He’ll come back from this. And he’ll bring the team with him. Did I miss something? Didn’t Leach keep his starters on the field all game long so he wouldn’t suffer the first white-wash of his coaching career? Stay classy, Pullman. Every year you lose “several valuable starters.” I’m not sure that is a point in Leach’s defense. Wow. That season was so awesome that today this happened. To their chief rival anyway…. ten more seasons of that and ten apple cup victories for the purple clad would suite them just fine…..